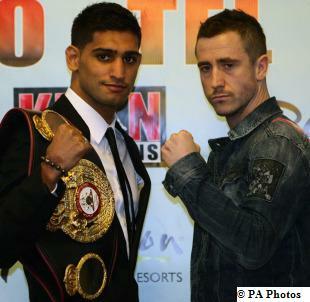 Amir "King" Khan (25-1, 17 KO's) won via sixth-round technical decision over Ireland's Paul "Dudey" McCloskey (22-1, 12 KO's), retaining his WBA junior welterweight title. Due to an accidental clash of heads in round six, the bout went to the scorecards where Khan received scores of 60-54 from all three judges. The victory marked Khan's 4th successful title defense since being kayoed in the first round by Bredeis Prescott on September 6, 2008. Now, Khan will look ahead to a potential unification fight with WBC/WBO junior welterweight champ Timothy Bradley (27-0, 11 KO's), which is tentatively scheduled for July 23rd. Khan's lightning-quick hand speed, and the ability to swiftly move in and out, frustrated the slick 31-year-old southpaw. Khan utilized his left jab mostly as a rangefinder throughout the fight. His jab enabled him to setup a fierce body attack to slow McCloskey, who was hurt a few times in the middle rounds by Khan's right-hand shots. In round six, Khan stepped forward while unleashing a straight right and clashed heads with McCloskey. The accidental headbutt left a deep gash above McCloskey's left eye. After the ringside doctor examined McCloskey, he deemed him unable to continue. Prior to his bout with Khan, McCloskey had stopped his last five opponents despite having only twelve career knockouts.